Put the fork down and look at that muffin top. Look at your whole body, really taking in what you look like. Now look away, close your eyes, and remind yourself of all the amazing things you have accomplished today: you cooked a wonderful meal, you consoled someone who was upset, you turned in an assignment ahead of the deadline. You are a wonderful person, and that muffin top isn’t going to get in the way of that. Put the fork down just long enough to remind yourself of this: the muffin top does not define you. The extra numbers on the scale do not define you. The fact that you do not look like a fitness model does not define you. What defines you is how you live in the world, what you believe, and how you treat others. What defines you are your hopes and your dreams and how you go about accomplishing them. Pick the fork up, because you’ve had enough. You’ve had enough of a society that deems you unworthy of enjoying a piece of chocolate cake because you don’t fit into an arbitrary and unrealistic ideal of beauty. 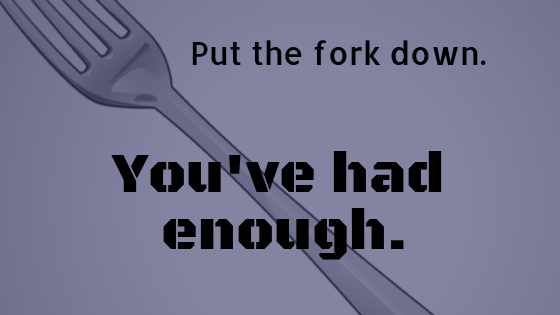 Pick the fork up, because you’ve had enough. You’ve had enough of judgmental people who see you for your body instead of your personality. Pick the fork up, because you are going to enjoy and savour a treat, tasting every bite, and eating it mindfully. It’s time to stand up and shout out that we’ve had enough. We’ve had enough of magazine covers telling us what we should look like. We’ve had enough of the attitude that we are unworthy of appreciation because we’re carrying a few “extra” pounds. We’ve had enough of the phrase “watching what we eat” meaning denying ourselves pleasurable food to “lose weight” for someone else. Watching what we eat should actually mean watching what we eat — as in, looking at what we are about to put in our mouths, and taking it in with all our senses. Eating mindfully, rather than mindlessly succumbing to the latest diet trend so we can reach some unattainable “ideal weight.” We’ve had enough of feeling guilty for truly enjoying food. Now pick up that fork, and eat that delicious slice of chocolate cake. Remind yourself that no food is a “bad food” as long as it’s eaten in moderation. Remember to move your body, feed your body, and love your body. Food isn’t the enemy — not even treat foods are the enemy. Food is for nourishment, and it can also be for enjoyment. Don’t deny yourself a piece of chocolate cake to fit in to someone else’s standard of what beauty looks like. You are already beautiful, and you can have your cake—and eat it, too. Next Next post: Dear Facebook, it’s not you; it’s me.